Roger Federer will face Stan Wawrinka in an all-Swiss final at the BNP Paribas Open after defeating Jack Sock 6-1, 7-6 (4) in Saturday’s second semi-final in Indian Wells. 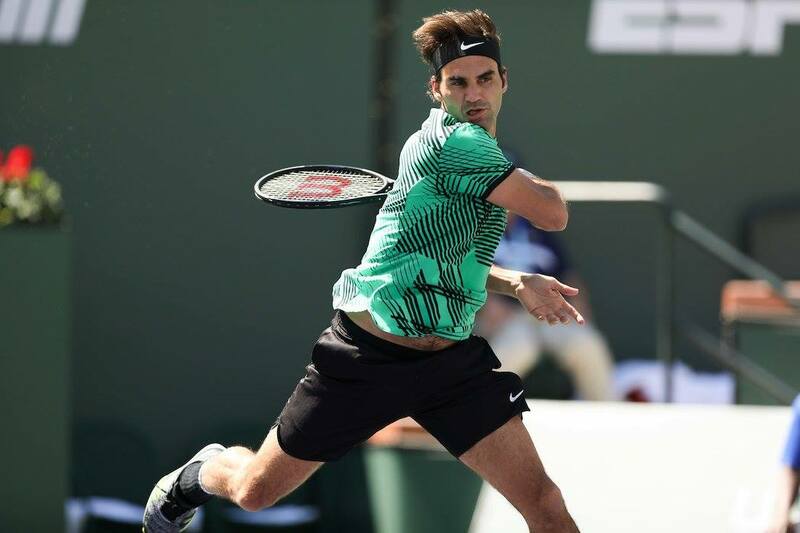 The 35-year-old Federer is through to his seventh final at the Indian Wells Tennis Garden and is looking to win the title for the fifth time, adding to his victories in 2004 (d. Henman), 2005 (d. Hewitt), 2006 (d. Blake) and 2012 (d. Isner). Federer will bid to win his 25th ATP World Tour Masters 1000 crown and 90th tour-level title overall. He takes a 19-3 ATP Head to Head rivalry lead over Wawrinka into the final and has won their past three meetings, including a five-set battle in the Australian Open semi-finals in January. "I think I definitely played great in the first set," said Federer. "I came out and really saw the ball well. I think Jack didn't have his best first set, but I found a way to take advantage of that quickly, hardly made any mistakes and was able to press. "The second set was more like what I expected the first set to be, to be quite honest, before the match. It was hard to break and return well off Jack's heavy serve. "I had to rely a lot on my second serve. I'm happy it was there, because I didn't serve particularly well in that second set. Things got a bit more complicated, but it was definitely a good feeling to get through in two sets and to be back in another finals here. "I think I've just been very focused during this tournament. That's something that usually goes away when don't play for a while. But I guess I have a lot of confidence from Australia, still." Federer’s backhand was telling as he raced past long-time rival Rafael Nadal in the fourth round earlier in the week, and Federer dominated from the baseline again against Sock, rolling back the years to claim victory in 74 minutes. A rifling backhand winner from Federer did lasting damage in the fourth game, as Sock then netted a smash and double faulted to lose serve to love and trail 1-3. A potent forehand winner from Federer gave the Basel native a double break lead at 5-1 as he cruised to a one-set lead. A bathroom break for Sock at the end of the first set settled the American, and he fended off a break point in the seventh game to stay close on serve with Federer, ultimately forcing a tie-break. Sock sparked hope for his fans as he hit a backhand winner for a 3-1 lead. But Federer immediately pegged him back and went on to win six of the next seven points to triumph for the third time in three ATP Head to Head meetings with Sock. "The first one got away from me pretty quick," said Sock. "I think he's been doing that to players pretty consistently this year, the Rafa match and some other ones he's played." Federer has yet to lose serve during the tournament, saving the only break point he has faced against Nadal. He was granted a walkover through the quarter-finals, when Nick Kyrgios withdrew on Friday due to illness, and had spent just 3 hours and 33 minutes on court coming into the semi-finals, compared to Sock’s 8 hours and 32 minutes. Sock saved four match points in a third-round victory over Grigor Dimitrov and was two points from defeat in a tense fourth-round round battle with Malek Jaziri. He advanced to his first ATP World Tour Masters 1000 semi-final by claiming his first Top 5 win over Kei Nishikori in another three-set contest on Friday. The 35-year-old Federer has returned to the tour in remarkable fashion in 2017, having missed the second half of last season due to injury. He beat Wawrinka and Nadal in back-to-back five-set contests to win his 18th Grand Slam championship at the Australian Open and has stormed through to the final in Indian Wells without dropping a set. The only blemish on his 2017 record was a second-round loss to World No. 116 Evgeny Donskoy in the Dubai second round two weeks ago. Wawrinka was even more dominant in the other semi, demolishing Spanish 21st seed Pablo Carreno Busta 6-3, 6-2. Federer said Wawrinka would present a different type of challenge than Sock. "Stan does a really nice job of defending and then creating, going from defense to offense. He's improved his serve. Especially as he goes deeper in the tournament, his confidence builds. That's when he's harder to stop," Federer said. "I have variation. I have an offensive mindset that's in my DNA. Sometimes for a player like Stan, he likes to have a bit more time and I can maybe rush him. But we'll see if that's possible tomorrow. He’s very steady off the baseline and can play from really deep in the court. I’ve got to play aggressive and play like I’ve been doing all week and hope it’s enough."